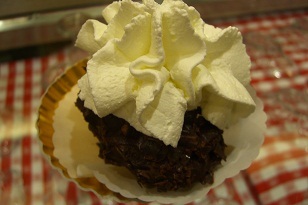 Jamie says: Mom spotted this chocolate cupcake-like dessert at Caffe’ Domiziano (Piazza Navona 88), which was conveniently located right next to our apartment on Piazza Navona. 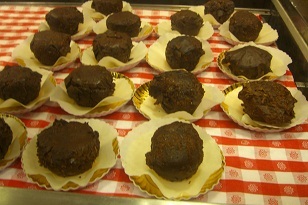 When I asked what it was, the Italian man said “tartufo.” Pretty much it’s Heaven on Earth. It was creamy, dense, slightly bitter dark chocolate gelato/ice cream with a chocolate shell and a heaping of whipped cream. It was rich, thick, and decadent…perfect for any chocoholic. Amazing!